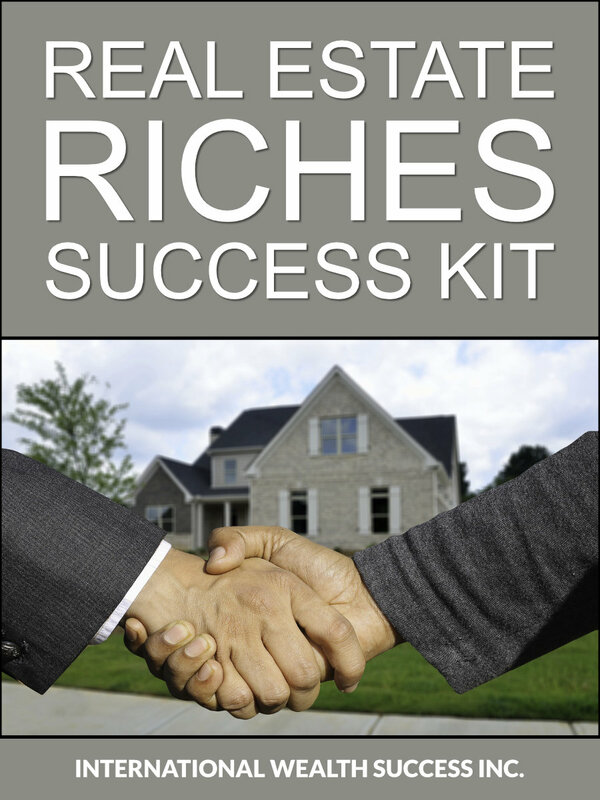 K-6 Real Estate Riches Success Kit shows you how to make big money in real estate as an income property owner, a mortgage broker, mortgage banker, real estate investment trust operator, mortgage money broker, raw land speculator, and industrial property owner. Contents: Mortgage Broker Guide; Mortgage Banker Guide; Income-Property Operation Data; Raw-Land Purchase and Sale; Industrial-Property Operation; Real-Estate Financing Methods; 2,500 Real-Estate Loan Sources; Sources of Distressed Properties; State Real-Estate Agencies and Administrations; Tax-Aspects of Real-Estate Operations and Ownership; Keeping Accurate Records of Real-Estate Operating Costs; Profit Aspects of Various Types of Real-Estate; 6 Speed-Read books, 500 pages; 8.5x11"; Price: $99.50. Available in Print or PDF. 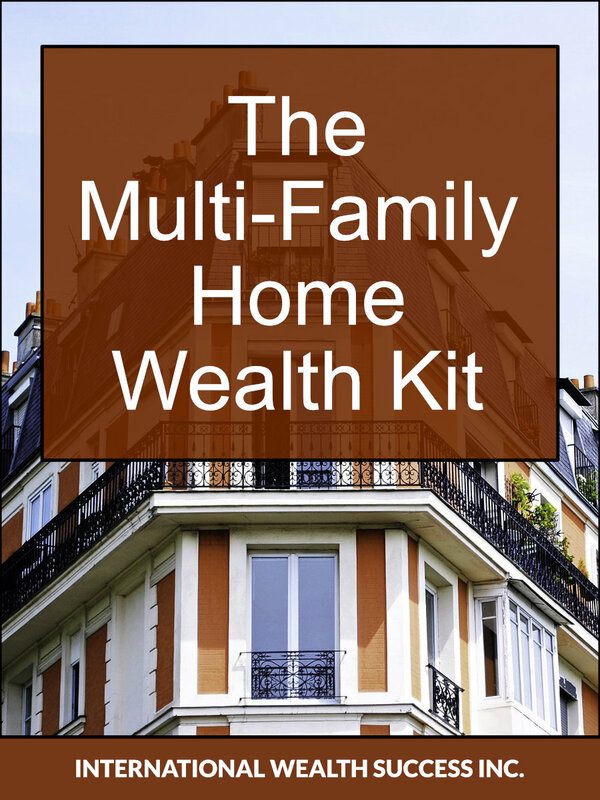 K-32 Multi-Family Home and Multi-Unit Real Estate Riches Kit by Tyler G. Hicks covers multi-family properties such as apartment houses, townhouses, garden apartments, condos and other residential income structures you might wish to invest in. Also discusses small, and medium, size office buildings you can own to build your real estate riches. Shows how, and where, to find, and buy, multi-unit properties for profitable income. This big Kit includes 4 special bonus reports to help you earn more in multi-unit properties. The bonuses include smart methods for creative zero-cash financing of multi-unit buildings, a special lender for multi-family apartment house financing, and where to find multi-family properties for sale. K-32 Multi-Family Home and Multi-Unit Real Estate Riches Kit: More than 200 pages, 8.5x11 in., Price: $150.00. How to Build Riches in Real Estate With Single-Family Homes Using Other People's Money gives you more than 150 ways to acquire and use single-family homes to produce maximum profit in today's market. Whether you buy, sell or rent, the Single-Family Home Success Kit gives you the best methods for producing the income streams you seek, using Other People's Money (OPM) to reach your goals as quickly as possible. Filled with practical advice, the Kit explains single-family home income streams and financing in clear language, using actual case examples and plans for a variety of scenarios. It also gives you more than 1,000 lenders who want to finance single-family homes. INCLUDES 4 IWS BONUS REPORTS: "The HUD Home Buying Guide," "Looking for the Best Mortgage," "Handbook on Adjustable Rate Mortgages," and Ty Hicks's 48-page "Fast Financing Methods for Real Estate Startup and Expansion--Tips and Techniques for Today's Fast Growth Properties." K-31 How to Build Riches in Real Estate With Single-Family Homes Using Other People's Money is an essential guide for new and experienced real estate investors. Contains more than 200 pages, in 8.5x11 in. format. Price: $150.00. Product K-31. K-28 Real Estate Investment Trusts Kit. A real estate investment trust (REIT) is a company that owns and manages income-producing real estate. By forming your own REIT, you can take over real estate at little or no cost. With this affordable Business Kit, you'll learn how to start your own REIT, acquire properties, and raise money for real estate deals that never has to be repaid. The REIT Kit details the types of REITs you can form, guides you in preparing the documents needed to start your REIT, gives an up-to-date list of brokerage houses that can sell your REIT, and shows you how to reap great tax benefits from your REIT. You can use your REIT for almost any type of real estate you like. Get the REIT Kit today and own income-producing real estate sooner than you ever dreamed possible. 8.5x11 in. ; more than 200 pages; $100.00. K-34 IWS Commercial Real Estate Riches Kit. Some of the largest real estate fortunes are earned in commercial real estate--that is, buildings and other facilities in which your tenants are there to earn money in the space they rent from you. Commercial real estate is all business. That's why it's much easier to run than residential real estate where people live in your building. Your tenants treat you as a fellow business person. So they pay their rent on time, allow you time to make any needed repairs, don't bug you on weekends, etc. Which numbers to use to figure your Net Positive Cash Flow from any property. Benefit from personal mentoring for YOU from Ty Hicks and staff to help you build YOUR riches in commercial real estate. K-34 Commercial Real Estate Riches Kit More than 300 pages, 8.5x11 in., Price: $150.00. This unique resource describes construction loan programs for a wide range of property types, including apartments, office buildings, residential homes, mixed-use properties, storage facilities, car lots, casinos, hotels, gas stations, golf courses, industrial facilities, medical buildings, senior housing, and retail shopping centers. Selected Lenders Providing Commercial and Residential Construction Loans in the U.S. and Canada covers financing for a wide range of property types, including apartments, office buildings, residential homes, mixed-use properties, storage facilities, car lots, casinos, hotels, gas stations, golf courses, industrial facilities, medical buildings, senior housing, and retail shopping centers. Listed lenders operate in geographic areas ranging from individual states and provinces to worldwide. Listed lenders operate in geographic areas ranging from individual states and provinces to worldwide. Whether you are an owner, builder or investor, getting the right construction loan is an absolute necessity. Selected Lenders Providing Commercial and Residential Construction Loans in the U.S. and Canada will help you get the best lender and loan for yourself or your client, whether you need money for building, improving, or retrofitting a single-family, multifamily or commercial property. Order your PDF eBook or paper copy today. in the U.S. and Canada. 190 pages; 8.5" x 11"; Print or PDF; Price: $29.50. Cash-Flow Notes/Mortgage Cash-Out Manual, 80 pages, 8.5x11 in. Kit contains more than 250 pages, 8.5x11-in., $150.00. Numerous real-life examples of people who have used this system successfully in their spare time are included. To further assist readers in acquiring the income real estate they seek, dozens of sources of funding are included. More than 200 pages; 8.5" x 11 "; $24.50. IWS-204E Specially Priced eBook: How To Make Sky-High Cash Profits In Today's Rock-Bottom Low-Priced Real Estate shows how you can make big profits in real estate in the 21 st Century--even with no down payment. Tyler G. Hicks, renowned consultant to wealth builders throughout the world, shows you how to: build your wealth with foreclosures; buy two properties a month with no down payment; nail down affordable financing in any market; build income from rents, services and parking fees; use smart financial controls to keep expenses down; collect rents and fees swiftly and efficiently; use creative real estate techniques to expand your fortune; and much much more. With a keen eye on current regulations and trends, Hicks reveals his surefire secrets for building real estate riches in the 21st century. Includes step-by-step techniques, strategies, checklists, tables, charts and case studies. (Download PDF eBook) 340 pages, 6 x 9 in., $9.99. IWS-78 How to Borrow Your Way To Real Estate Riches identifies ways, in one, easy-to-understand volume, to borrow all the money you need to get real estate which will produce a huge yearly income for you. With no money of your own and no special real estate training, you can start right now to take advantage of this dynamic income-producing system to build your fortune in real estate. Backed up with dozens of real-life examples, this guide reveals the expert techniques for getting the financing you need to acquire valuable real estate. Gives key information on scores of clever ways to purchase apartment houses, shopping centers, undeveloped land, single-family homes and industrial properties. Paperback; 8.5x11"; $20.00. IWS-87 How to Buy and Flip Real Estate for a Profit! Learn how to buy, hold and flip retail real estate for fun and a huge profit--while steering clear of novice mistakes. Author and real estate expert Rod L. Griffin shows his readers the importance of buying cheap and selling high in the new millenium. The new millenium offers a wide array of opportunities for the real estate investor. This practical guide reveals these opportunities and shows how to take advantage of them in almost real estate market. Filled with ready-to-use strategies, checklists, real life case studies and success stories, this great book will show you how to: make cash in days, not years; get into retail real estate investing a business; buy low and sell high--qualify the property for sale; learn the best kept financial secret in real estate to receive 100% financing; invest with no risk; sell your investment property fast; buy and leverage property with no money and little credit; maximize your investment profits; create a retail real estate money machine; and much, much more. Paperback, 198 pages, 5 x 8 inches, $19.50. IWS-17 How to Build Real Estate Riches With Low-Cost Properties shows both beginning and experienced real estate wealth builders how to get pre-foreclosure and post-auction properties at low cost, how to finance any income property, smart steps to getting a down payment loan, using options to control property, smart mortgage methods, finding valuable abandoned properties, and more. 100 pages, 8.5x11"; $21.50. M-6 Refinancing Proposal for a Multi-Family Apartment House. Shows how a large apartment house can be refinanced to enhance its competitive position in its marketplace. 61 pages; $12.50. IWS-14 Real Estate Money Raiser's Quick Guide to Successful Project Finance by Tyler G. Hicks gives dozens of proven ways to raise money for real estate projects of all kinds--from single-family homes to multi-building residential, industrial or commercial projects. These hands-on methods can be used by both beginning and experienced real estate wealth builders. 96 pages; 8.5 x 11 in. ; $21.50. IWS-40 Option Wealth Opportunities--How to Make Big Money in Real Estate with Options--A Speed-Read Report. This valuable report shows you how to build wealth in real estate using options to control desirable properties for little cash (sometimes as low as $1). You can sell, or lease, these properties for a profit, using options like those shown in the report. Gives step-by-step procedures, along with several examples of actual option documents. 36 pages, $20.00. IWS-88 209 Fast Spare-Time Ways to Build Zero Cash Into 7 Figures A Year In Real Estate is one of Ty Hicks' highly popular how-to books for the budding real estate investor and for experienced investors seeking promising new ideas and projects. Ty Hicks' best-seller gives you hundreds of real-world examples, showing how to start in real estate on zero cash of your own. 209 Fast Spare-Time Ways to Build Zero Cash into 7 Figures a Year has 12 chapters, 288 pages and hundreds of letters from people who've made money using strategies outlined by the author. The book covers all the bases, from finding loans to hiring an accountant and an attorney to help with the business. It will keep you on the edge of your chair--eager to get into the profitable business of real estate today. The author gives you proven strategies to get started in just days. Using actual case examples, Ty Hicks illustrates how much MIF—Money in Fist—you can realistically earn by investing in real estate. And he shows you dozens of different, cooperative sources of money for all your real estate deals. Product Questions? Call 1-800-323-0548 between 8am and 10pm Eastern Time.